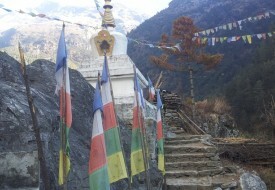 This trek is very popular for short trekking. After about one hour drive to Sundarijal, the climbing starts through Shivapuri National park. The route goes through Mulkharka to Chisapani (2140m). On the way you can enjoy the view of Kathmandu valley including Tribhuwan International Airport. Natural flora and fauna, rhododendron forests, wildlife and lush dense forest are found in plenty. A great view of Mt. Annapurna Range, Mt. Langtang range and Mt. Gaurishankar can be captured from Chisopani.